The Mayor of London has released details of diesel exhaust for every significant road link in London after a formal request from Clean Air in London (CAL) using powerful European access to environmental information laws. The World Health Organisation (WHO) classified diesel exhaust as carcinogenic for humans in June 2012 Note 2. Roads: 41,713 sections of road in London up to and including the M25. These have been released together with Transport for London’s road classification for them. The information has been provided in an Access database file with separate summaries for emissions of NOx and PM10 for each category of road transport in 2010. CAL is publishing thousands of pages of this information for benzene, NO2, NOx, PM2.5 and PM10 in 2012 with a ranking of the worst roads. Interactive guide to pollution levels on London roads published on the Guardian’s websitehttp://www.guardian.co.uk/environment/interactive/2013/jul/08/interactive-guide-pollution-london?CMP=twt_guImportant: Please bear in mind that Mayor Johnson has disclosed computer modelling estimates of ‘emissions’ from tailpipes not actual ‘concentrations’ of air pollution in the air we breathe which may be available separately. Legal limits and WHO guidelines are set in terms of concentrations not emissions. Within the data, CAL considers emissions in tonnes per kilometre per year are a better indication of the air pollution challenge than tonnes per year since the latter will appear disproportionately high if a road link is long e.g. a motorway. 8. those living near busy roads, often the poorest people, will be most exposed to the most harmful air pollutants. Air pollution has not fallen as predicted by the Mayor’s computer modelling. Annual average levels of NO2 in Oxford Street and Brompton Road are well over twice legal limits in legislation since 1999 to be complied with by 1 January 2010 Note 8. London has the highest levels of NO2 of any capital city in Europe Note 6. CAL has passed the information released by the Mayor to the Conservative, Green, Labour and Liberal Democrat parties in the London Assembly to aid their scrutiny of the Mayor of London’s efforts to reduce air pollution in London. “In environmental terms, this is like discovering the Rosetta Stone. All of a sudden Londoners can decode air pollution on their doorstep – in a nutshell, it’s the ‘who’, ‘what’, ‘where’ and ‘when’ of air pollution in London. 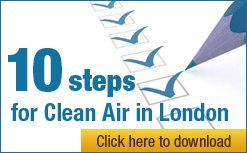 Clean Air in London applauds the Mayor for releasing this information. “Health guidelines and legal limits are set in terms of billionths of a kilogram whereas this data reveals emissions in tonnes or hundreds of kilograms per kilometre per year. It is particularly valuable to see the sources of nitrogen dioxide (NO2) emissions which are rarely disclosed despite it being one of the two most important air pollutants for public health and legal compliance. It will take months to analyse the data fully. “Every politician, campaigner, resident, worker and business in London can now see summary information for the most dangerous forms of air pollution. Clean Air in London is also launching its free Clean Air in Cities IndexTM (or Birkett IndexTM) App which reports the health impact of long-term exposure to air pollution (PM2.5) on the population in local areas, regions and England as a whole Note 10. The App can be downloaded at http://itun.es/i6xj69k. Clean Air in London urges the Mayor to update the data used by the App annually and the diesel exhaust data every two years. “Clean Air in London hopes campaigners, local authorities and others will challenge the Mayor where claimed emission reductions, based on computer modelling, have not been reflected in reductions in concentrations of regulated air pollutants reported by monitoring equipment. People can request further information from the Mayor or Transport for London using powerful European access to environmental information laws. “People can protect themselves by walking down less polluted roads and reduce pollution for themselves and others by walking or cycling or using public transport rather than driving a diesel car. For indoor air quality, people can ask if buildings with mechanical ventilation use regularly maintained air filters that comply with British and European standard EN 13779. “Ultimately, the only answer is for London to eliminate completely deadly diesel exhaust from the most polluted parts of London by 2020. By doing so, London can lead the way in Europe and elsewhere in innovation and creating a successful, truly balanced economy. 3. Clean Air in London submitted requests for details of emissions of diesel exhaust for every road in London carrying an average of 10,000 vehicles per day or more on: 30 September 2012; 9 November 2012; and 28 February 2013. The Mayor declined these requests. CAL sought an internal review of the third refusal after taking legal advice from Gerry Facenna, a leading barrister at Monckton Chambers. The Mayor responded favourably to this request and released the information on 3 June 2013. 10. The innovative new Clean Air in Cities IndexTM (or Birkett IndexTM) reports the health impact on the population of long-term exposure to PM2.5 in local areas,regions and England as a whole. The Clean Air in Cities IndexTM (or Birkett IndexTM) App can be downloaded from the App Store. It can be found at http://itun.es/i6xj69k or by searching for ‘Clean Air in Cities’ on the App Store. 11. The words Clean Air in LondonTM, Clean Air in Cities IndexTM and Birkett IndexTM along with their associated logos are trademarks or registered trademarks of Clean Air in London, a company limited by guarantee, registered in England and Wales, with company number 7413769.